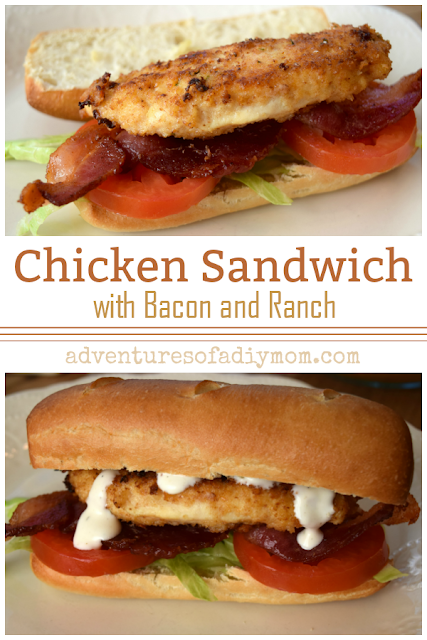 A delicious sandwich with breaded chicken, crispy bacon, a toasted bun and ranch! Pair with some fruit salad and you have the perfect summer dinner. This is my son's absolute favorite meal. So when I decided to teach my kids to cook this summer, this is the first thing he chose to try. We did a little video of him cooking these. He's pretty excited about it. Be sure to check it out at the bottom of the post. My goal this summer is to teach my kids to cook. At the end of the summer, I want to be able to say "You're in charge of dinner tonight" and they can make dinner without my help. I'm not just talking about throwing something in the microwave so they can survive, but to really learn how to make meals. Of course, my kids range in age from 8 to 16, so the expectations will differ from child to child. However, I think I often underestimate what they are capable of. I'm trying really hard to let them do all the steps and learn by doing. Sometimes that's REALLY hard to do! I really have to try hard not to step in and do it "my" way. These chicken sandwiches are pretty easy. But for kids, it's probably an intermediate level dish - mostly because you have to cook the chicken in hot oil and that requires a bit of maturity. 1.Slice lettuce and tomato, and set aside. 2. Cook bacon until crispy and set aside. 3. Flatten chicken to 1/4" thickness. Heat a few tablespoons of oil in a pan on medium high heat. 4. Place milk in a small bowl. Place bread crumbs and Parmesan cheese in another bowl and mix. Dip chicken in milk, then into the bread crumb mixture and coat evenly. 5. Cook chicken in oil on medium high heat, turning once. 6. Slice deli rolls and toast under the broiler for a minute or two. 7. 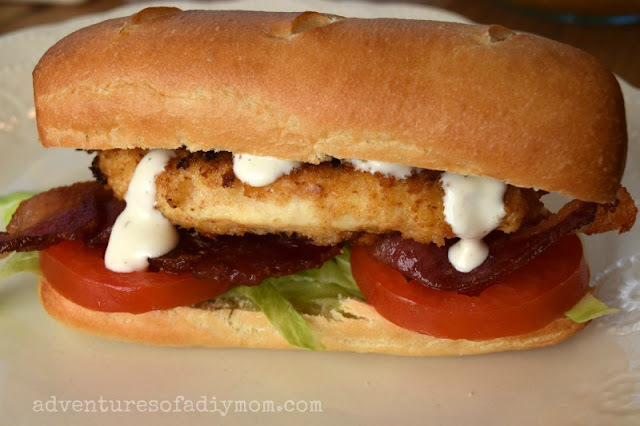 Layer chicken, bacon, lettuce and tomato on roll and top with ranch dressing. I played around with the idea of videoing their adventures in cooking. We gave it a go, and it has really helped me step back and let the kids cook - because I'm doing something too. I'm very much a novice with video, but I'm learning. Last night my son and I did a voice over for this chicken sandwich. You can really hear his personality and his excitement for his favorite dinner shine through. I'm excited to share it with you! My son and I would like to hear any feedback you have. Did you enjoy the video? Is there anything you don't understand? How can we improve? This is definitely a learning process! Next up: Cheesy Sausage and Pasta Skillet Dinner with my 8 year old! This is something I need to do with my kids as well. My son is 11 and I've started giving him some pointers, but this recipe would be a good way to move forward, as it's something he loves to eat. Thank you for sharing at The Really Crafty Link Party this week. Pinned. Easy and amazing recipe. will definitely cook your recipe this weekend. keep sharing such amazing recipe with us. What a great project and it is a delicious sandwich! Thanks so much for sharing with us at Full Plate Thursday and have a great week!